Bahram I (Middle Persian: 𐭥𐭫𐭧𐭫𐭠𐭭, Wahrām, Persian: بهرام یکم‎‎, Bahrām) (also spelled Varahran or Vahram, r. June 271 – September 274) was the fourth Sasanian emperor of the third Iranian Empire. He was the eldest son of Shapur I and succeeded his brother Hormizd I (r. May 270 – June 271), who had reigned for only a year. Bahram I was known as "a benevolent and worthy king". Bahram I was the son of Shapur I. He had 3 brothers, who were named Hormizd I, Narseh, and Shapur Mishanshah. The theophoric name Bahram comes from middle Persian Varahrän, 'victory', that is represented by the Zoroastrian divinity Vahram. 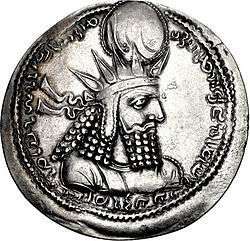 According to a Pahlavi inscription, Bahram I was the son (not, as the Greek historiographers and Tabari note, the grandson) of Shapur I (r. 241–272). The earliest reference to Bahram I occurs in the coronation monument of Bahram's grandfather Ardashir I at Naqsh-e Rajab. There, the future king appears as a smaller figure between Ardeshir and Ahura Mazda, and Bahram is seen bowing before the divinity after whom he is named. Similar iconography, such as the boar motifs in the seals and crown of Bahram, apparently reinforced the association with the yazata of victory. Bahram died (apparently of disease) in September 274. He was succeeded by his son who bore the same name and is known to history as Bahram II. Under the guidance of Kartir, Bahram I had the prophet Mani, the founder of Manichaeism (and the author of the Shapurgan, which was dedicated to Bahram's father Shapur I) sentenced to death. Mani died in his cell shortly before his execution. However, rumors persist that Mani might have been flayed alive: his skin, stuffed with straw, is said to have been suspended for some time over one of the gates of the great city of Shahpur. On orders of Bahram I, the prophet's death was followed by the persecution of his disciples. Manichaeism was relatively well established by that time, and was supported by numerous priests under a hierarchy of religious leaders that including twelve apostles and seventy-two bishops. Nearly all of them were handed over to the Zoroastrian clergy, who - under Kartir - considered Manichaeism a heresy and caused the followers of Mani to be executed or otherwise punished. Bahram I did not have good relations with Rome. Zenobia, the wife of Odenathus had established herself the regent of Palmyra in the name of Odenathus minor son. However, Odenathus had expanded his little kingdom to such a large extent that it now arouse the jealousy of the Roman Emperor. Hence despite the fact that the dealings between Rome and Palmyra were friendly, the Roman Emperor Aurelian still commissioned a force to capture Palmyra in the year 273. Zenobia appealed to Bahram for help, who then provided her with an armed contingent. Despite this assistance, Zenobia lost the battle and was forced to flee. She once again appealed to Bahram I for asylum but was overtaken and captured before she could cross into Sassanid-controlled territory. Bahram I appealed to the Roman Emperor for peace and dispatched envoys to Rome. Aurelian accepted Bahram I's gifts and the terms of peace offered. Hence, in the triumph which Aurelian celebrated at Rome in the year 274, no Persian captives appeared in the procession, but Persian envoys were exhibited instead, who bore with them the presents wherewith their master had appeased the anger of the emperor. ↑ SASANIAN DYNASTY, A. Shapur Shahbazi, Encyclopaedia Iranica, (July 20, 2005). ↑ Touraj Daryaee, Sasanian Persia, (I.B.Tauris Ltd, 2010), 10. ↑ Bahrām I, A. Sh. Shahbazi, Encyclopaedia Iranica, (August 24, 2011). ↑ Bahrām I, A. Sh. Shahbazi, Encyclopaedia Iranica. ↑ Elton L. Daniel, The History of Iran, (ABC-CLIO, 2012), 61. Shapur Shahbazi, A. (2005). "SASANIAN DYNASTY". Encyclopaedia Iranica, Online Edition. Retrieved 18 March 2014.